The Verdict – What Does It Mean – Really? – Why in this country is a person deemed “suspicious” simply because he is black and male? – What justification is there for a man carrying a gun on the street that can be used to threaten and kill another human being? – What justification is there for vigilante-ism in which a townwatch guard can ignore police calls to leave the “suspicious” person alone and let the police investigate the matter? – Why in this country are there gated communities that create an atmosphere of fear and trust leading to tragedies like this? – How extensive are the inadequacies of a legal system that can exclude these larger issues from the case, and focus on minute details and lawyers’ gamesmanship in a search for the truth? – How can a case like this be prosecuted and any mention of the racial and class dynamics involved be excluded from the courtroom? Regardless of what happened the night that George Zimmerman and Trayvon Martin had their altercation, this verdict sends a very troubling message. I am reminded of an African-American women in one of my courses years ago, who said that when she learned she was pregnant with a boy, she wept for fear of what he would go through in this society. I am reminded of a poem written by another student more recently describing the ways in which a child’s life is circumscribed and threatened simply because he is black. I reminded of one of my middle-aged African American colleagues who shared that when he walks into stores or on the streets of the predominantly white suburbs, he does not feel safe. Many white folks would dismiss these fears as false perceptions. However, when you look at the rates of poverty, incarceration and premature violent death, those fears have pretty solid grounding. 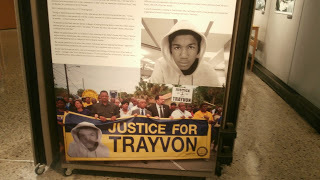 The death of Trayvon Martin reinforces those fears, which in turn gives rise to deep and profound anger and distrust. While many might rightly say our society has come a long way from days of Jim Crow segregation, lynchings and a racist justice system, this case and the issues surrounding it remind us of how far we have yet to go. Unfortunately for the Martin family, as well as George Zimmerman, this trial had much more to do with larger meanings and symbolism, than it did about the tragic event that happened on Feb 26, 2012. If there is one good thing to point to in this situation, it is that outside the courthouse and around the country as people protested and grieved the verdict, there were many white people in the crowd protesting with their black brothers and sisters. To my black friends who may be deeply angered and upset by the outcome of this trial, all I can say is while I cannot begin to understand what it is like to be black in America in 2013, I stand with you.